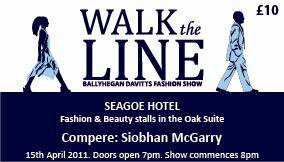 Ballyhegan Davitts presents Walk the Line, a Fashion Show! Friday 15th April 2011, 7pm in the Seagoe Hotel, Portadown. Tickets are available from any committee member. Further information is available from Patricia Nixon & Charlie or Bernie McKeever. Your support is most welcome!